By gaining comparisons to the fabled piano duos of Ashkenazy-Previn and Argerich-Freire (American Record Guide), the Magalhães-Schumann duo, best known as TwoPianists, has already left an indelible mark on the musical world. 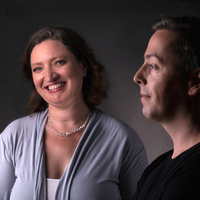 Comprised of established musicians Luis Magalhães and Nina Schumann, TwoPianists was formed in 1999 when the pair met as students of maestro Vladimir Viardo at the University of North Texas. Now based in Stellenbosch, TwoPianists has become one of the finest chamber music groups on African soil. An intimate knowledge of the two-piano repertoire, in combination with sound command of technique and a finely developed sense of ensemble, have allowed TwoPianists to focus on the nuance and detail that has won so much praise from critics. In addition to many performances for a devoted South African following, TwoPianists have also toured extensively throughout the US, Europe, China and Japan, to widespread critical acclaim. The duo has also given masterclasses both in South Africa and abroad, including masterclasses at New York’s Juilliard School. The ensemble’s debut recording, comprising the full works for two pianos by Rachmaninov and released by Universal Music, established their reputation as recording artists.